Screen Brightness: Super-Bright 12-Volt, 11-Watt LED Panel with Dimmable Touch Button Technology. LED Lamps: Super Bright Energy Efficient Flicker-Free LED Lamps that are Maintenance Free and last up to 50,000 hours. Unit Design/Weight: Light weight and ultra thin 3/8" profile designed for easy portability. Frame Size: 19-1/2" x 26-3/8"
Working Surface Size: 17" x 24"
Working Surface Diagonal Size: 29 1/4"
NO SHADOW, NO GLARE, PROTECT EYES. LitEnergy LED light box provides ideal working lighting environment for penmanship and design. Providing the most comfortable lighting environment for animators, designers, art enthusiasts. children and reader. DIMMABLE TOUCH BUTTON TECHNOLOGY LitEnergy Light Table helps to achieve the ideal light level. 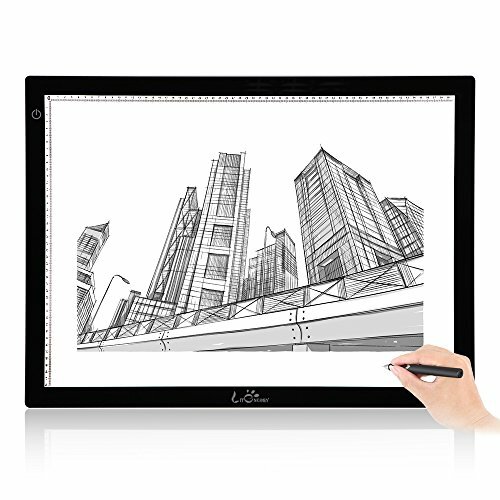 EASY CARRYING LitEnergy Lightbox supplies super thin, super convenient, masterpiece design. WIDELY USED LitEnergy box light tracing can use in Stenciling, 2D animation, Calligraphy, Embossing, Scrapbooking, Tattoo Transferring, Sketching, Drawing, Sewing Projects, Stained Glass, Quilting, Enhanced Visualization and so on. EXACT SIZE NOTICEMENT. LitEnergy lightbox uses printing scale for measurement. Easy for drawing. If you have any questions about this product by LitEnergy, contact us by completing and submitting the form below. If you are looking for a specif part number, please include it with your message.